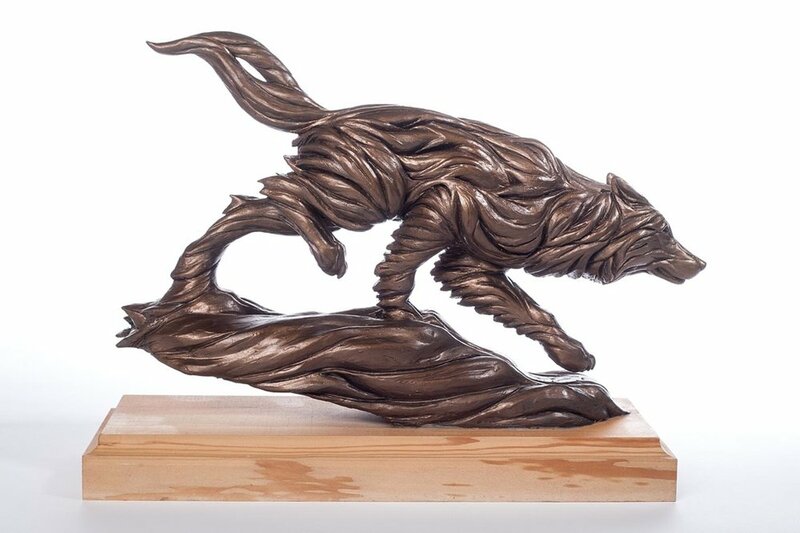 This whimsical concept, based on my Spirit series of wildlife sculptures, depicts a coyote in mid flight, jumping after a fleeing mouse. This sculpture will be highly stylized with large negative spaces, giving it an airy, ghost-like appearance with maximum visual momentum. 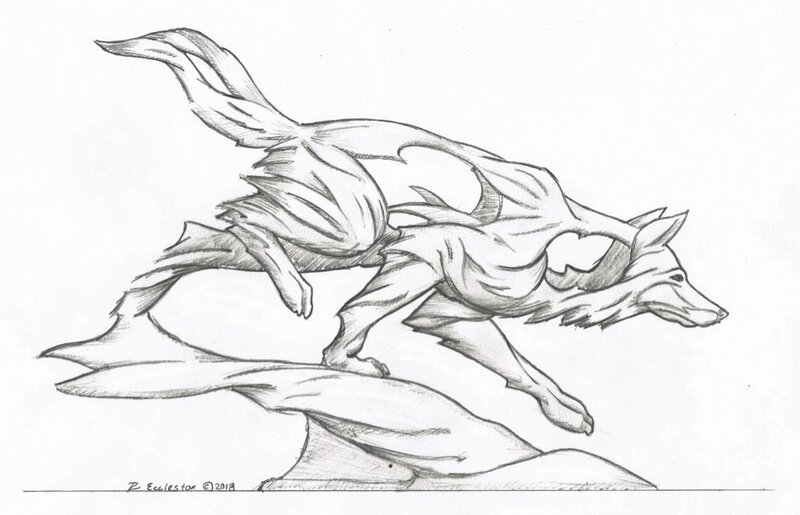 This concept depicts the mystical qualities of the coyote. I wanted the fur to have a flowing feeling that moves across the body and ground like a ghostly mist. I want the viewer to feel like they are looking across a misty prairie, seeing something move in the distance, but not sure if it is real or their imagination. Throughout history, cultures all over the world have associated themselves with animals. Cultures choose animals whose "spirits" contain the attributes they wish to embody. Universities, schools, sports teams, and military units all use animals to define their organizational spirit and values. Research into this phenomenon led me to develop and explore my "Spirit Series" of wildlife sculptures. Whether the subject is a pack of wolves moving as one, a solitary wolf, a snow leopard pouncing, or the majesty of a bighorn sheep, I use free-flowing lines and negative space to define the muscle and fur patterns to express the grace, motion and true spirit of the subject. Although the bulk of my work has been creating public art for veterans and civic memorials, I have been diligently working to perfect my Spirit Series, waiting for the right opportunity to debut them. My approach to creating art for public places is to work with my clients to create sculpture that inspires. It all starts with a conversation. I believe in listening to my clients to find out their vision and specific needs for their project. The nature and permanency of public art demands that the design meet the highest standards society can place on it. Much like people, a sculpture only gets one chance to make a first impression. It is important that the design be dynamic and powerful so it immediately creates a bond with those who view the artwork.